European Space Agency (Esa) member states are putting 240m euros (£210m) into industry so that the Ariane 5 rocket can continue to be exploited. The company that operates the vehicle, Arianespace, has made losses in each of the past two years, even though it is the dominant player in its market. Esa, which developed the big rocket, agreed to the cash injection at a two-day council meeting in Paris. The decision follows an assessment of the costs of running the rocket system. This assessment, ordered last year by member states, was intended to gauge where efficiencies could be found in the supply and operation chains. The new money covers the period up until the major meeting of European space ministers at the end of 2012. It is expected that a plan will be on the table by then to put Arianespace and its operations on a more sustainable footing. 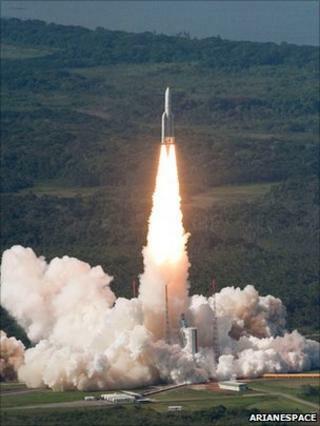 Ariane 5 rockets launch from the Kourou spaceport in French Guiana. Six or seven flights are conducted each year, usually lofting two satellites at a time. Through a subsidiary, Arianespace also markets Russian Soyuz vehicles, which historically launch out of the Baikonur and Plesetsk cosmodromes, but which will soon fly from French Guiana too. The company is also bringing online a third, but much smaller rocket called Vega to carry into orbit institutional or scientific payloads weighing up to 1.5 tonnes. An Ariane 5 is scheduled to launch next on 30 March. The vehicle will put the Yahsat 1A and Intelsat New Dawn telecommunications satellites on paths to take up geostationary positions 36,000km above the Earth. The combined mass of these satellites will be about nine tonnes.